GILD Collective's cofounders celebrating recent success in obtaining initial customers. From left: Kelsey Pytlik, Jessie Deye, Rachel Bauer McCreary. They’ve been booking parties (five of them) and recruiting local instructors (14 of them). This is important because their business model involves people hosting crafting parties—booking the parties will equal sales. GILD Collective makes these parties easy by providing supplies and expertise to make it a fun and productive experience for the people involved. By booking and holding these initial parties, GILD Collective will be able to further refine its business model and craft a winning customer experience. People can learn more and book a party on their website. They’re working on furthering the development of their brand. It’s no surprise that branding is a big part of going through the accelerator experience at The Brandery; hence the name of the accelerator. GILD Collective is working with an agency to further refine this important aspect of their business. They’ve completed their initial structural legal matters, which involves their operating agreement and other related contracts. As mundane as some of these items may seem at first blush for some people in startups, they’re very important because they can set the tone for relationships and how the business team will function. 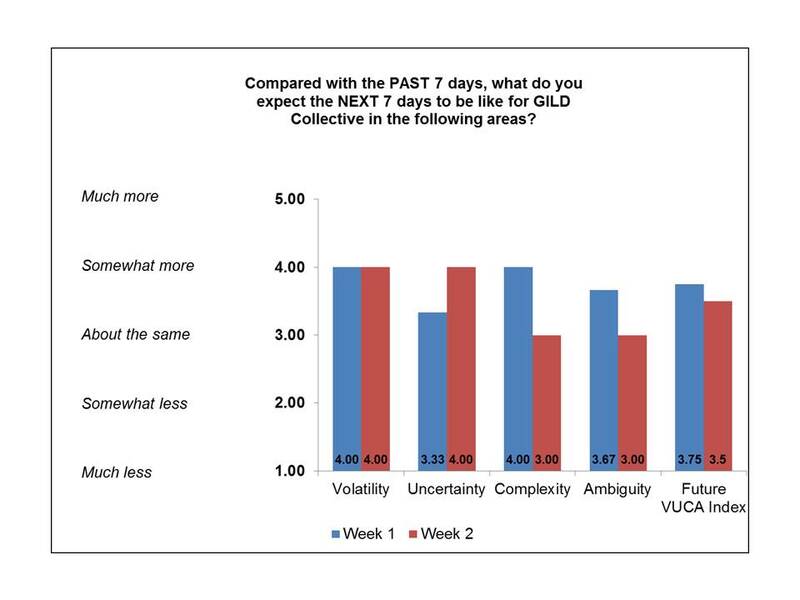 The team continues to experience a high level of volatility, uncertainty, complexity and ambiguity (VUCA), with ratings of each by the team members being relatively similar to last week’s ratings. The team is starting to fight through the VUCA that they face with some pivoting and smart experimentation. In addition to their model of using instructors to lead the crafting parties, they’re trying a model in which the hostess of the party leads the event without an instructor. To supplement the expertise provided by an instructor, the team is providing instructional materials in the form of photos and videos. As they move into this week, Jessie, Rachel and Kelsey are focusing first on acquiring more users within the Cincinnati area. The more users they get and parties they’re able to support, the more they’ll learn (and earn). These steps are critical as they try to gain momentum and move toward their Demo Day in October, when they’ll have the opportunity to showcase their business to investors, who may decide to fund another round of investment for the firm. Internally, the team has decided that they must prioritize showing customer interest, loyalty and advocacy above the digital experience on their website. This doesn’t mean they’re not working on that part of how customers will interact with GILD Collective, but it does mean that they’re going to allow their experimentation and business model refinement drive what the online experience should be like in the future. Externally, the team is also experimenting with variable pricing, better rewards for party hostesses and hosting some parties themselves to start spreading the word-of-mouth marketing that such a startup so desperately needs. Check back in next week for another update from GILD Collective as they navigate the VUCA world of startups.